"Worship is the central defining act of our Community." The Reverend Ellen Rowse Spero. 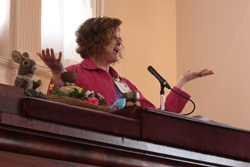 As Unitarian Universalists, we do not have a creed, so we name, celebrate, lift up and bear witness to values and practices grounded in right relationship with each other, the sacred, and beloved community. We believe that personal experience, conscience and reason should be the final authorities in religion. 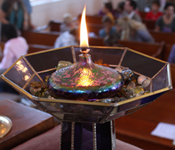 Whatever our personal spiritual beliefs, we share a commitment to building and nurturing our beloved community as expressed in our congregational and Unitarian Universalist Association covenants. 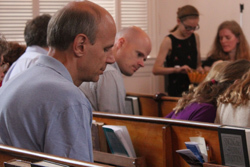 Our regular service is held on Sundays at 10:00 AM in the Sanctuary (September through June) and lasts about 45 minutes. On the third Sunday of each month we hold a Sunday evening service. We gather at tables in the chapel from 5:30 to 6:30. The centerpiece of our evening worship is nourishment - hearty soup and bread for our bodies, shared discussion of spiritual questions for our souls. Blended with our traditional practices of music, meditations, and readings our time together is one of worship and community. Most weeks, the sermons are recorded and are available as podcasts so that you can still hear the sermon, if you are unable to make the service. 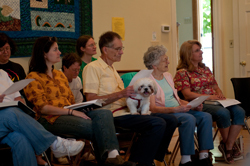 Hearing Assistance is available during our services. The ushers will be happy to help you.